With its significant update inside and out, the 2016 Nissan Altima midsize sedan remains competitive with stalwarts like the Honda Accord and Toyota Camry, as well as ever-better players like the Hyundai Sonata and Kia Optima. The new, sportier SR trim that is available with both 4- or 6-cylinder variants should also help widen the Altima's appeal. 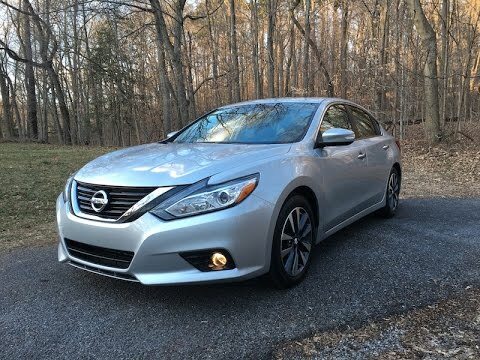 My 2016 4 cylinder, fully loaded Nissan Altima has 6 cylinder power, shows well. I purchased the Altima brand new. It is fully loaded and even though it is only a 4 cylinder, it has a lot of power with excellent gas mileage. It is very comfortable for long distance trips, and the safety features are great, including the blind spot sensor and the rear view screen which appears when the car is in reverse. The back seats are comfortable with good legroom noted. The Bose stereo system and Bluetooth capability are two of the excellent features of this car. The style of the 2016 Altima is sleek with smooth angles, and the car shows well. The trunk is a good size and the rear seats are split and can go down, so that there is a pass through from the trunk to the back seat, which comes in handy when transporting long items, I. E. An ironing board. My vehicle is very reliable and great on gas. I only have to fill is up twice a week. The car is also very spacious. My daughter love its it as well as it fits her car seat very comfortably. I also love the fact the fact that it has Bluetooth so while I am driving my phone is connected automatically to the car and I am able to be hands free. Another great feature it that the car shows the tire pressure and on all 4 tires at all times which is great for when it get cold in Georgia. Overall I am completely satisfied with this car, this is my second Nissan Altima in 7 years. This was also the car I purchased in college. I strongly recommend this vehicle as a first time car, a primary car or a secondary car just to have a cruise around in. Things are not always as expected because they are new! Nissan is the best car I have ever owned and honestly when I could walk in and pay cash for my car I know I would be a Nissan, the 2016 Altima was it because I had a 2006 and man I loved that car so that was the brand new one I was going to have. Worst mistake of my life! Everything is good until you get on the highway and all you can hear is the road noise and the wind nice and any other nice on the outside of the car, nobody can figure it out and I have had it to 3 different dealers and nobody can help. So now I am stuck with my car that I really not happy with but she is still new and will not just trade it in and take a big loss. Nissan North America, Inc. (Nissan) is recalling certain model year 2016-2017 Nissan Maxima, 2013-2016 Nissan Altima, NV200, LEAF, Sentra, and Pathfinder, 2014-2016 Nissan NV200 Taxi, Infiniti QX60, QX60 Hybrid, and Q50 Hybrid, 2014-2017 Nissan Rogue and Infiniti Q50, 2015-2016 Nissan Murano, Murano Hybrid, and Chevrolet City Express, 2014-2015 Nissan Pathfinder Hybrid, and 2013 Infiniti JX35 vehicles. In these vehicles, the front seat passenger Occupant Classification System (OCS) may incorrectly classify an adult passenger as a child or classify the seat as empty despite it being occupied. As a result, the passenger frontal air bag may be turned off and not deploy in the event of a crash. If the passenger frontal air bag does not deploy as intended in the event of a crash, the passenger is at an increased risk of injury. Nissan will notify their owners. Chevrolet City Express owners will be notified by General Motors. Dealers will reprogram the Air Bag Control Unit (ACU) and OCS Electronic Control Unit (ECU) in Altima, Maxima, Murano, Rogue, and Sentra vehicles, and replace the OCS ECU in LEAF, NV200, NV200 Taxi, Pathfinder, Infiniti Q50, JX35, and QX60 and Chevrolet City Express vehicles, free of charge. Interim notices were sent to owners on May 31, 2016. Owners will receive a second notice when remedy parts become available. Owners may contact Nissan customer service at 1-800-867-7669, Infiniti customer service at 1-888-833-3216 or Chevrolet customer service at 1-800-222-1020.